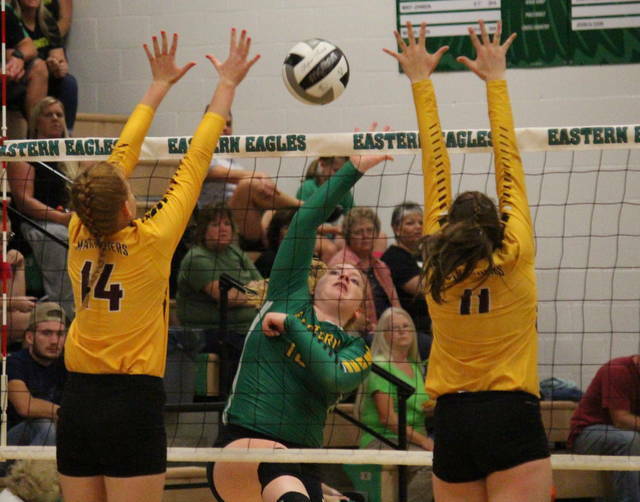 Eastern sophomore Jenna Chadwell (4) blocks Marissa Noble’s spike attempt, during the Lady Eagles’ victory on Wednesday in Tuppers Plains, Ohio. Meigs junior Breanna Zirkle (9) comes up with a dig, during Wednesday’s non-conference match in Tuppers Plains, Ohio. TUPPERS PLAINS, Ohio — Queens of the county, again. 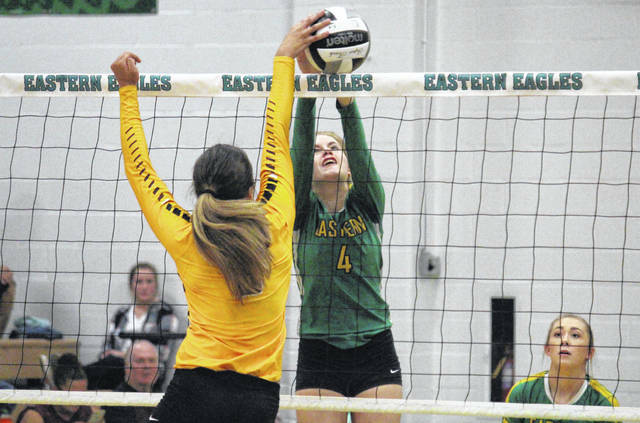 For the second straight season, the Eastern volleyball team finished 4-0 against the other Meigs County schools, as the Lady Eagles topped Meigs in five games in a non-conference match at ‘The Nest’ on Wednesday. Eastern (11-3) scored the first four points of the night and charged out to a 12-6 lead in the first game. Meigs (4-16) battled all the way back to take its first lead of the night at 16-15, and stretched its advantage as high as four, at 21-17. EHS regained the edge at 23-22, fought off a pair of tie scores, and ultimately won the first by a 26-24 count. The Lady Eagles jumped out to a 4-1 lead in the second game, but the guests took over at 8-7. The next 20 points were split evenly and featured a quartet of lead changes to go with nine ties, leaving Eastern with an 18-17 lead. The EHS lead grew to a game-high four points, at 22-18. but the Lady Marauders claimed six of the next seven to move into a game-point situation. Eastern tied the game at 24, but surrendered back-to-back points, as Meigs evened the match with a 26-24 victory of its own. There were a pair of early lead changes in the third game, with MHS taking the advantage for good at 5-4. The Lady Marauders claimed 20 of the next 29 points to win the third game by a 25-13 count, moving ahead 2-1 in the match. Meigs took four of the first five points in the fourth game, but Eastern rallied back to take the lead at 6-5. The next 20 points were again split evenly, this time with four lead changes involved, leaving EHS with a 16-15 edge. The hosts went on a 5-0 run to pull away from MHS, and eventually forced a fifth game with a 25-19 win. Eastern led wire-to-wire in the deciding game, scoring the first four points and leading by as many as 10, en route to the 15-6 triumph. Following the victory, EHS head coach Mykala Sheppard was pleased to finally see her team play to its potential in the final set. “The last set was a positive, watching them play together, be motivated and excited, it’s fun to watch when they play like that,” said Sheppard. “Before that, we did the exact opposite, we did not play well together. Communication was an issue, probably our biggest issue, communication and missed serves. For the Lady Marauders, head coach Lea Ann King was happy with her team’s effort, regardless of the final result. In the match, Eastern had a 51.5 side-out percentage, while Meigs’ was 50.5. EHS had 13 aces and a 91.3 serve percentage, while the Maroon and Gold had a trio of aces and a 92.1 serve percentage. The hosts earned a 38-to-37 advantage in kills. 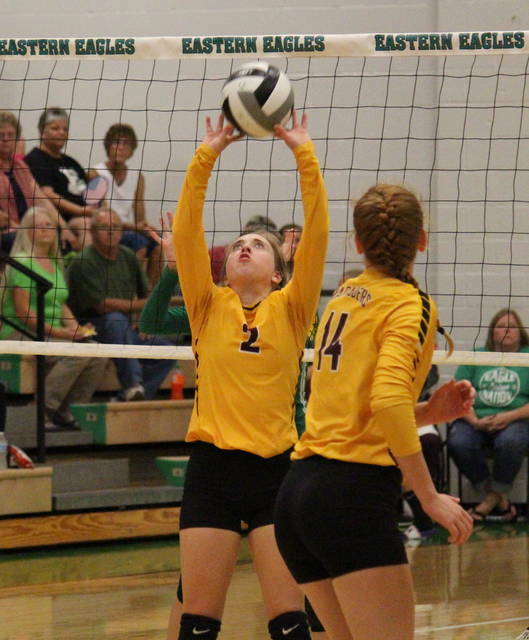 Jenna Chadwell led the Lady Eagle service attack with 16 points, including a pair of aces. Caterina Miecchi had a dozen points and a match-best five aces in the win, Kelsey Casto came in with 11 points and a trio of aces, while Alexus Metheney had six points and an ace for the victors. Allison Barber earned four points and one ace for the Green and Gold, while Haley Burton and Kylie Gheen had one point apiece, with an ace by Burton. Madison Fields paced the Lady Marauders with a match-best 18 service points, including one ace. Marissa Noble contributed nine points to the MHS cause, Baylee Tracy added seven points and a team-high three aces, while Maci Hood and Mallory Hawley came up with six points apiece. Breanna Zirkle ended with two points and an ace in the setback, while Kylee Mitch chipped in with one marker. At the net, EHS was led by Miecchi with 13 kills, followed by Allison Barber with seven kills and a block. Layna Catlett posted six kills and three blocks, Olivia Barber pitched in with five kills, while Chadwell earned four kills and a team-best 22 assists. Casto picked up a pair of kills for Eastern, while Gheen claimed one. 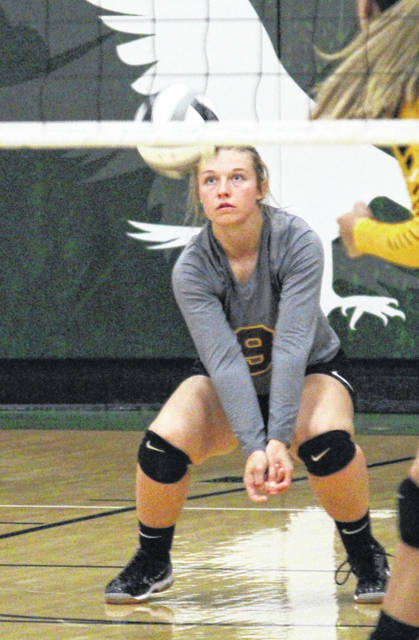 Sydney Sanders led the Lady Eagle defense with 13 of the team’s 52 digs. Noble and Hawley both posted 11 kills to lead the Lady Marauders, with Noble also earning a pair of blocks. Hood and Hannah Durst had five kills apiece, with Durst adding three blocks, while Fields had four kills and a match-best 32 assists. Mitch earned one kill in the contest, while Zirkle had 21 of the team’s 101 digs to lead the defense. The Lady Eagles also defeated Meigs on Aug. 23, in straight games at MHS. Eastern — which visited South Gallia on Thursday — will be back home for a meeting with Federal Hocking on Saturday. The Maroon and Gold have a bit of a break before returning home to host Vinton County on Tuesday.